Definition at line 40 of file LiveRegMatrix.h. There are interfering virtual registers assigned to PhysReg or its aliases. This interference could be resolved by unassigning those other virtual registers. A fixed live range is in the way, typically argument registers for a call. This can't be resolved by unassigning other virtual registers. 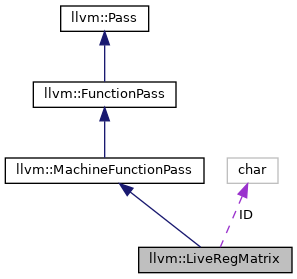 The live range is crossing an instruction with a regmask operand that doesn't preserve PhysReg. This typically means VirtReg is live across a call, and PhysReg isn't call-preserved. Definition at line 83 of file LiveRegMatrix.h. Definition at line 45 of file LiveRegMatrix.cpp. References llvm::AnalysisUsage::addRequiredTransitive(), llvm::LiveIntervalUnion::Array::clear(), llvm::MachineFunctionPass::getAnalysisUsage(), llvm::MCRegisterInfo::getNumRegUnits(), llvm::TargetSubtargetInfo::getRegisterInfo(), llvm::MachineFunction::getSubtarget(), llvm::LiveIntervalUnion::Array::init(), invalidateVirtRegs(), llvm::AnalysisUsage::setPreservesAll(), and llvm::LiveIntervalUnion::Array::size(). This will mark VirtReg's live range as occupied in the LiveRegMatrix and update VirtRegMap. The live range is expected to be available in PhysReg. Definition at line 103 of file LiveRegMatrix.cpp. References assert(), llvm::VirtRegMap::assignVirt2Phys(), llvm::dbgs(), foreachUnit(), llvm::VirtRegMap::hasPhys(), LLVM_DEBUG, llvm::printReg(), llvm::printRegUnit(), and llvm::LiveInterval::reg. Check for interference before assigning VirtReg to PhysReg. If this function returns IK_Free, it is legal to assign(VirtReg, PhysReg). When there is more than one kind of interference, the InterferenceKind with the highest enum value is returned. Definition at line 185 of file LiveRegMatrix.cpp. References llvm::LiveIntervalUnion::Query::checkInterference(), checkRegMaskInterference(), checkRegUnitInterference(), llvm::LiveRange::empty(), foreachUnit(), IK_Free, IK_RegMask, IK_RegUnit, IK_VirtReg, and query(). Check for interference in the segment [Start, End) that may prevent assignment to PhysReg. 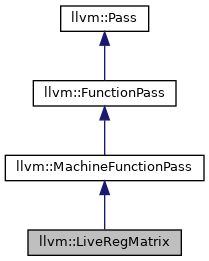 If this function returns true, there is interference in the segment [Start, End) of some other interval already assigned to PhysReg. If this function returns false, PhysReg is free at the segment [Start, End). Definition at line 208 of file LiveRegMatrix.cpp. Check for regmask interference only. Return true if VirtReg crosses a regmask operand that clobbers PhysReg. If PhysReg is null, check if VirtReg crosses any regmask operands. Definition at line 145 of file LiveRegMatrix.cpp. References llvm::LiveIntervals::checkRegMaskInterference(), llvm::BitVector::clear(), llvm::BitVector::empty(), llvm::LiveInterval::reg, and llvm::BitVector::test(). Check for regunit interference only. Return true if VirtReg overlaps a fixed assignment of one of PhysRegs's register units. Definition at line 163 of file LiveRegMatrix.cpp. References llvm::HexagonISD::CP, llvm::LiveRange::empty(), foreachUnit(), llvm::LiveIntervals::getRegUnit(), llvm::LiveIntervals::getSlotIndexes(), llvm::LiveRange::overlaps(), and llvm::LiveInterval::reg. Directly access the live interval unions per regunit. This returns an array indexed by the regunit number. Definition at line 154 of file LiveRegMatrix.h. Invalidate cached interference queries after modifying virtual register live ranges. Interference checks may return stale information unless caches are invalidated. Definition at line 81 of file LiveRegMatrix.h. Referenced by llvm::RegAllocBase::allocatePhysRegs(), and LiveRegMatrix(). Returns true if the given PhysReg has any live intervals assigned. Definition at line 137 of file LiveRegMatrix.cpp. Query a line of the assigned virtual register matrix directly. Use MCRegUnitIterator to enumerate all regunits in the desired PhysReg. This returns a reference to an internal Query data structure that is only valid until the next query() call. Definition at line 177 of file LiveRegMatrix.cpp. Unassign VirtReg from its PhysReg. Assuming that VirtReg was previously assigned to a PhysReg, this undoes the assignment and updates VirtRegMap accordingly. Definition at line 120 of file LiveRegMatrix.cpp. References llvm::VirtRegMap::clearVirt(), llvm::dbgs(), foreachUnit(), llvm::VirtRegMap::getPhys(), LLVM_DEBUG, llvm::printReg(), llvm::printRegUnit(), and llvm::LiveInterval::reg. Definition at line 66 of file LiveRegMatrix.h.